Samsung Galaxy Note Review - Is it a Tablet or Smartphone? Samsung galaxy note was officially launched in India last week. The Samsung Galaxy Note has solid look and amazing features which we all waited for. 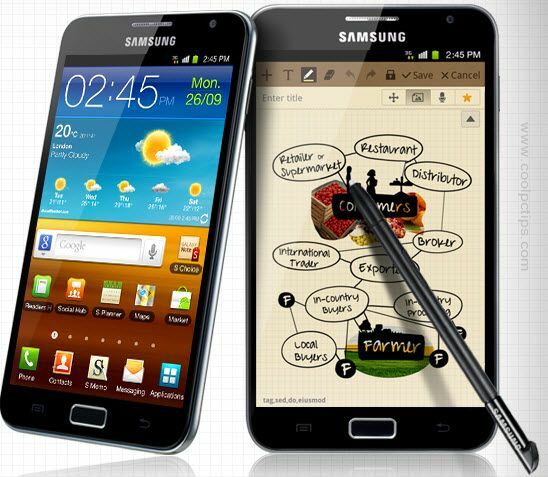 The Samsung Galaxy Note is a great innovation and a complete new type of smartphone which you will love to play with. You will be confused seeing the galaxy note that whether this is a smartphone or a tablet. The unique features and great looks of this device made people to love this phone in less time. The Galaxy Note is a ultimate on-the-go device which has core benefits of diverse mobile devices and still maintaining the smartphone portability. The phone is really smart with which you can do everything you ever desire to do. Samsung Galaxy note is large in size and the immersive screen with smartphone portability, Full screen utilization for fast and effective tasking, Powerful performance and free capturing, creation and other features has made the phone popular. I will list out all the amazing features of Samsung galaxy note below. 5.3 inch large screen display with light and thin design. The world’s 1st ever HD super AMOLED display. Minimum screen scrolling and transition. A smart and Intuitive scheduler – S Planner. The best multi-input which provides you with the ability to freely capture and create ideas anywhere you want. S Pen combined with the full touch screen to create awesome input experience. With S Pen you can create sketch drawings, write notes with super accuracy and ease. The S Memo lets you record all forms of ideas instantly. You can take a quick memo from any screen to capture your ideas. You can capture pictures, voice recordings, typed text, hand written notes, drawings and etc. Expressive personalization of photos and videos. Draw rich communication of ideas and emotions. Advanced 8 MP camera with vivid large display. 1.4 Ghz powerful dual core processor and HSPA + 21Mbps or 4G LTE network speed. Comprehensive security capabilities like MDM and H/W encryption. Professional mobile meeting with UCC . Uncompromised secure access via VPN, BIG-IP. Multi-input business experience with S Pen. Efficient real time record to planner and memo. These are the amazing features of Samsung Galaxy Note. If you want to check out the specifications of Samsung Galaxy Note, then here you go. Processor : 1.4 GHz Dual core processor. Display : 5.3″ WXGA (1280 x 800) screen, HD Super AMOLED. Video : 1080p Full HD video recording & playback, Recording : 1080p@24-30fps, Playback : 1080p@30fps, Codec:MPEG/H.263/H.264/Xvid, WMV, VC-1, DivX. Audio : Codec – MP3, AAC, AMR, WMA, WAV, FLAC, OGG and Music player with SoundAlive, 3.5mm Ear Jack, Stereo FM Radio with RDS. Multi-Input : Full touch, S Pen. Connectivity : Bluetooth v 3.0 + HS, USB 2.0 HOST, Wi-Fi 802.11 a/b/g/n, and Wi-Fi Direct. Sensor : Accelerometer, Digital compass, Proximity, Barometer, Light. Value-added Features : Popular android apps. These are the specifications of the Samsung Galaxy Note. The phone has been launched into the market with a price tag of Rs:34,990. Hope you have liked the post. If you have any queries, please leave a comment below. I hope you will have great fun with your new Samsung Galaxy Note. can the galaxy note which is 2.3 gingerbread, be upgraded to 2.4 ice cream sandwich? also when will the note be available in kerala. Yeah , its hard to find whether it is a tablet or a smartphone . BTW , it comes up with great features , and personally , I like S Pen technology the most .